"Hi, my name is Dale Simpson, I was a student at CTS from 1961 to 1964 and have many happy memories of that period. 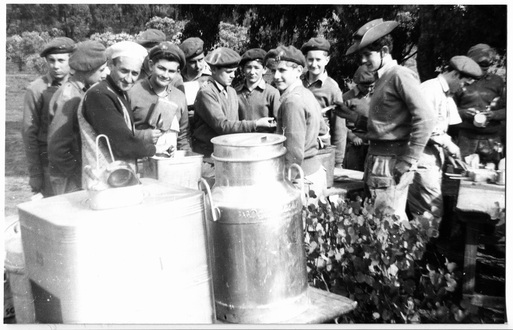 Camp Westlake came just after my time but, I did attend many cadet camps. Unfortunately, I do not have any school form photographs because they were a bit costly for us at the time. A few teachers' names that have stuck in my memory are Rex Monday (Maths & Science), Ivan Holmes (Music), Alf Holland (Religious instruction) and Mr Woods; the head master. 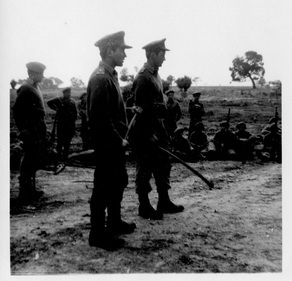 The three photos on this page were taken by one of the cadets at our annual Puckapunyal Camp, I think it was 1964 but could have been 1963?" - Past student of Collingwood Technical College, Dale Simpson. "Looking at the photos on your site and a few other sites I can see that some changes took place after I left, for example there used to be an entrance tunnel of sorts which was behind the wall with the mural leading off Johnston street, it seems that has been bricked in perhaps to form another room? Also there is a steel stair structure on the three story old section (the bottom floor was a change room for PE) which is at the north end of the turning & fitting shop, access to this building used to be at the opposite or hall end and was an old wooden structure which I climbed on several occasions (we had maths classes on the top floor several times, the place looked very old even then!). Looking at Google Earth I can see some large trees which were not there in my day. I must say, looking at the walk-through photos taken in more recent times, depressed me a bit. It seems that the place has suffered much from vandals and the like. During my last visit in 1972, I had called in to see Ivan Holmes for a short visit and was surprised to see kids from Abbotsford Tech in the school grounds; it seems they were using some of the T&F facilities." - Past student of Collingwood Technical College, Dale Simpson. 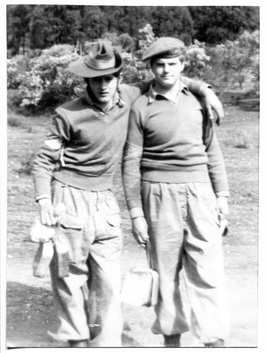 Albert Cassar (LEFT) and Dale Simpson (Right) at Puckapunyal in 1963-1964.